This month we’re excited to have a guest on the blog, artistic director Darren K. Woods. He brings us a play-by-play of his experience at this year’s New Works Forum, held annually at Opera America since 2012 as a discussion epicenter and idea incubator for the many and various voices that produce new opera. Without further ado, here’s Darren! The New Works Forum at Opera America is one of my favorite meetings to attend each year. Now in its seventh year (and I’ve been to every one), it is a wonderful gathering of composers, librettists, producers, singers, funding professionals, conductors, dramaturgs – well – every type of person who makes new opera happen. This year Seagle Music Colony was incredibly well represented. On Wednesday, Tony took the train down from Schroon Lake so that he could be at rehearsal the next morning for The Ghosts of Gatsby, Evan Mack and Joshua McGuire’s new chamber opera that was workshopped at SMC this summer. “Gatsby” was one of the three operas to be showcased at the forum. Seagle, along with Opera Birmingham and Samford University, commissioned the opera, and it was a wonderful opportunity to reunite with Keith Wolfe, who was a singer and managing director at Seagle for many years and is now the General Director of Opera Birmingham. 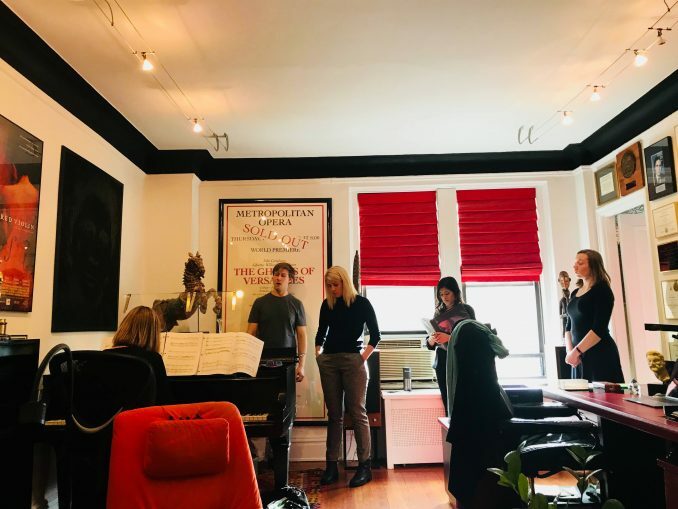 Mark Adamo, composer of Little Women and Lysistrata, another new work we’ve done at SMC, and his partner, Oscar-winning composer John Corigliano, hosted us in their home for rehearsal all day Thursday. We put together a stellar cast, including a number of SMC alumni. Scott Clark was F. Scott Fitzgerald, while Francesca Mehrotra was Zelda 18 and Shelley Mihm was Zelda 24. One of the artists from the premiere in Birmingham, Kathryne Overturf, sang Zelda 48. Our own Jennifer McGuire was at the piano. While rehearsals commenced on Thursday, I was on a train to NYC to arrive in time for the first session of the New Works Forum. It is always such fun to enter the lobby of Opera America and immediately reconnect with all your friends. The first session always sets the parameters of the next three days; we all discuss what we hope to get from being with each other over the course of the forum. The main event for Thursday was the world premiere of p r i s m by Ellen Reid and Roxie Perkins. The opera was a psychological wild ride that dealt with sexual abuse and whether or not someone could recover from such a traumatic event. What I liked most about the evening was experiencing the sound world of Ellen Reid. She writes beautifully for the voice and her haunting choral writing was also powerful. There was a reception, but after getting up at 4:00 a.m. that morning, I needed to head to the hotel for a good night’s sleep. Friday was the busiest of our four days in New York with four sessions and then the showcase that evening – so basically 10:00 a.m. to midnight! The day started with a practical “primer” on the commissioning of new work. It was a great de-mystifying of details around contracting, budgeting, fundraising, and audience engagement. Those of us who successfully completed multiple commissions in the past talked about how to work with unions when you are in a union house. Overall the session was very enlightening. After a break we went into a session entitled “Opera in the #MeToo era”. This was a very important session that everyone wanted to have. We discussed how to make rehearsal a safe place for everyone, what an artist should do when they are uncomfortable in a rehearsal, how to report incidents, and many other issues. The bottom line was this: trust and communication are what we must have in order to respect everyone and still put on amazing theater. After a short lunch break we had two more sessions about building the 21st century canon of new opera. I popped in to to our final Gatsby rehearsal at 4:00 p.m. to check in, and the artists were excited and ready to work. We had the theater from 5:00 p.m. – 5:30 p.m. to check spacing and at 6:00 p.m. we were the first showcase to perform. It was wonderful to see it in New York with a capacity audience of industry professionals confirming what we all knew at the workshop last summer – that The Ghosts of Gatsby is a fantastic opera! As the cast got enthusiastic cheers and bravi’s, Evan and Josh showed the world that they are ready to play in any city in the world. 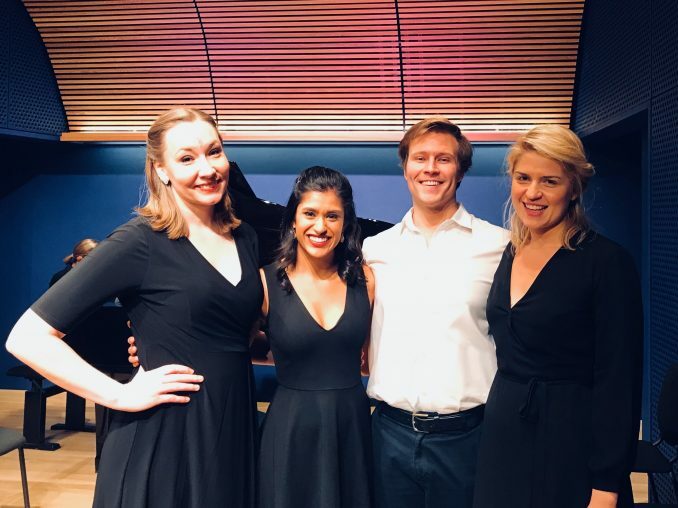 The next showcase was Houston Grand Opera’s The Phoenix by Tarik O’Regan and Johan Caird, which featured SMC alumna Vanessa Becerra. The last performance of the night was The Last American Hammer by Peter Hilliard and Matt Boresi. I loved that piece too! It was very, very funny and a fitting way to end the evening. Our cast and SMC family were so excited, we went out together for a delicious Italian dinner. Saturday brought more sessions, the most interesting of which was At the Intersection of Art and Politics. This, needless to say, provoked a rich discussion on everything from immigration to sexual politics. The centerpiece of Saturday was the opening performance and New York premiere of The Falling and the Rising, which many of you know was developed at The American Center for New Works Development at Seagle Music Colony and which we also toured this past fall. It was great to be back with our friends from the U.S. Army Field Band and Soldiers’ Chorus as they once again took on the roles they sang at the Seagle workshop and later the premiere in Fort Worth, TX. The show was really well received! We were all so proud that Seagle Music Colony was the company that brought this piece to life for the first time, and now it was on display for all of our colleagues to see and hear. Sunday morning held a quick feedback session on The Falling and the Rising, and then Evan and I hopped on a train to return to the North Country. We all felt tired but energized and ready to go out and produce more exciting new opera!